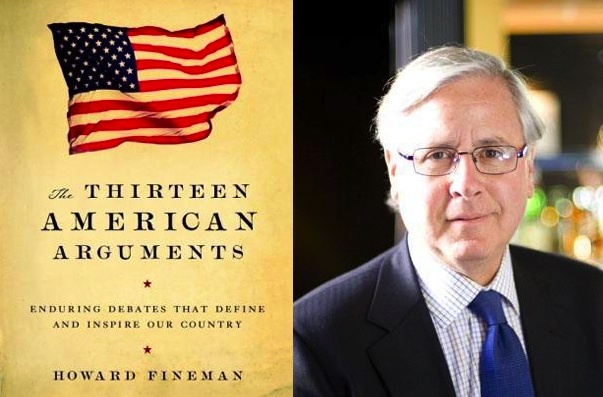 Howard Fineman’s book The Thirteen American Arguments: Enduring debates that define and inspire our country (2008) is an impressive attempt to categorize the essence of America’s political debate into thirteen grand arguments. I welcome the effort. Ambitiously, Fineman (of Newsweek and MSNBC) presents what he sees as the “thirteen foundational arguments that comprise our public life” (p. 4). His definition of an argument is “something besides shouting or name calling, … a clash between at least two people (or regions, political parties, candidates, or economic interests) over facts or ideas in the search for answers—in this case, answers to questions about the future and fate of America” (p. 4). The gist of Fineman’s book is that the United States is “the Arguing country, born in, and born to, debate”, and that “the habit of doing so” makes the United States “unique” and gives it its “freedom, creativity, and strength.” Contrary to the conventional wisdom that we argue too much, Fineman contends that “we in fact do not argue enough, about the fundamentals. If we fail to draw strength from our argumentative nature, we risk losing what made us great and gives us hope. Our disputes are not a burden, but a blessing” (p. 4). To be honest, it’s tempting to dwell on the inadequacies of Fineman’s categorization of American political debate. It’s always easier to critique than to create. However, while a critical approach would be in line with Fineman’s emphasis on the importance of argument, it wouldn’t necessarily be productive. Importantly, The Thirteen American Arguments must be read for what it is: A well-written and interesting journalistic account of American political debate in a historical perspective. Fineman is, as he writes, “neither a scholar nor a historian” (p. 4), but a reporter. The book does not hold scholarly ambitions, and it describes historical events in broad strokes. Fineman writes that “genralizations are imperfect,” but that “they can be useful in sorting out the tribes and nations of the planet.” (p. 4). Although the political scientist in me would like to review Fineman’s thirteen American arguments on its merit as a potential analytical framework of American political debate, I’ve decided to embrace his generalizations instead. It is up to each of us to decide which parts of our heritage—which sides of which arguments—are the ‘right’ ones to meet the moment. If this book in any way enhances that process, then my two aims—to define and inspire—become one. So let the American Arguments begin—again. It’s beautiful in theory. But it would seem as if shouting and name calling is the name of the political game these days. Sadly, encouraging Americans to dive into the quintessential American arguments is almost an academic exercise when no one seems to adhere to the most basic rules of argument. You need to see in order to draw and paint, and a constructive argument depends on the ability to listen. Let other people’s perspectives and insights color your own reasoning. Fineman colored mine. Like any other successful and charismatic pol …, he was born without the gene that produces the emotion of embarrassment in the human soul (p. 36). Here is a rule in politics: If you are going to say something suicidally insulting, do not do it while looking at a video camera operated by the person you’re insulting, especially if that person works for the campaign of your opponent (p. 40). Fineman, Howard (2008). The Thirteen American Arguments: Enduring Debates that Define and Inspire our Country. New York: Random House. This entry was posted on August 16, 2010 at 2:25 PM and is filed under Books. You can follow any responses to this entry through the RSS 2.0 feed. You can leave a response, or trackback from your own site. Wonderful website. A lot of helpful info here. I’m sending it to several pals ans additionally sharing in delicious. And obviously, thank you on your sweat!